These Chalkboard Signs Are In-Stock and Ready to Ship! Order Online for More Savings. These Chalkboard Signs will Ship Out Immediately When Ordered by 1pm EST (M-F). Two-sided 24" x 36" blackboards give users double the writing surface to write messages. Meant for use with regular stick chalk or liquid chalk markers to write messages. 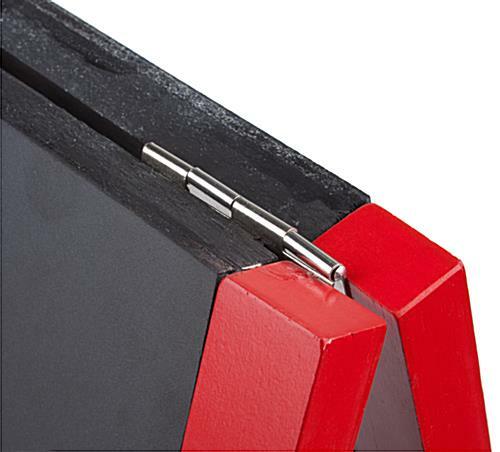 Features top metal hinges for unit to fold down for portability and stowing. Fabricated from hardwood with a bright red frame to grab attention from those who pass. These chalkboard signs deliver messages to passersby and potential customers. Get the word out about menu changes, sales, special events and ongoing promotions with this write-on board. 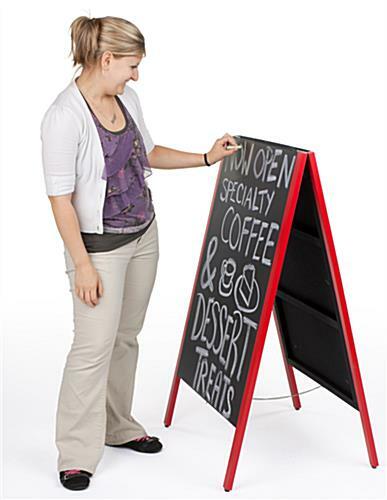 These write-on boards, chalkboard signs are engineered from wood with bright red finished framework. The sidewalk sign commands attention no matter where they are placed in. 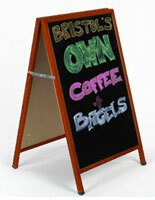 These a-frame blackboards, indoor chalkboard signs help to promote daily specials and increase walk-in sales. Each unit comes with two 24" x 36" writable black textured surfaces that give users plenty of space to create and design their own colorful and enticing messages. 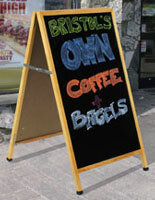 These chalkboard signs that are double-sided, can effectively communicate your messages to passerby customers. Passersby traffic can see the promotions while they are walking from either direction. These chalkboard signs that have a red finish are an ideal placement in any restaurants, bars, cafes and retail locations. 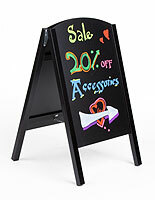 Display your important announcements or daily specials for all to see with these easel blackboards. 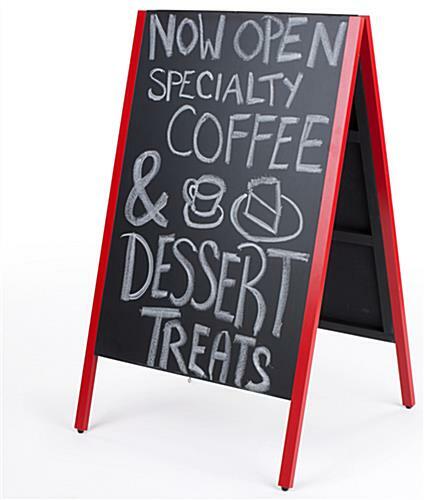 Place these red chalkboard signs that feature the write-on blackboard on any busy and high-traffic areas to draw in more customers. Customers are required to use regular stick chalk to write on the textured blackboards. Messages can be easily cleaned off by using any damp cloth. 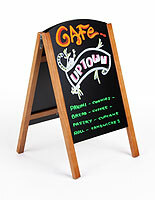 For places that require frequent changes these write-on chalkboard signs, like sidewalk displays and a-frame blackboards will be an ideal tool. However, liquid chalk and wet erase markers may also be used but the ink may be more difficult to wipe away. Therefore, a magic eraser will be included with the unit to help clean off the ink from the board. 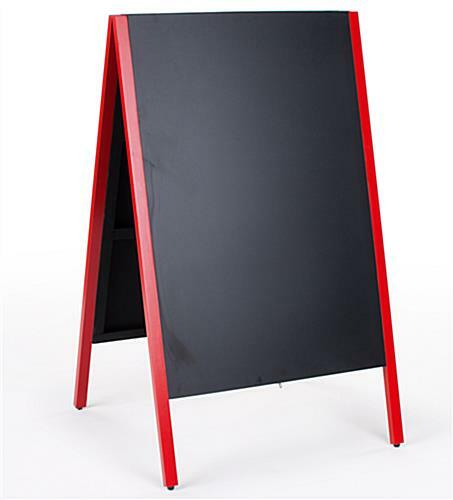 Although these red finish chalkboard signs are meant for use indoors, businesses can also place them outside (under fair weather conditions). There are metal hinges along the top that are designed to fold the unit flat. 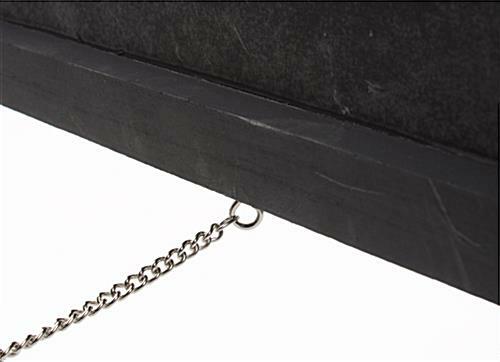 When not in-use, the a-frame blackboards can be easily folded together for easy portability and stowing. 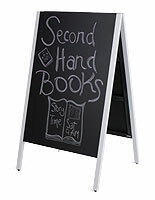 This site offers these a-frame blackboards in white finish as well. 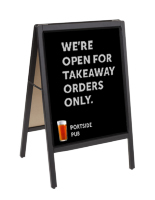 Any businesses looking to bring the foot traffic in from outside are welcome to include these a-frame blackboards.